Talk about an appropriate title. 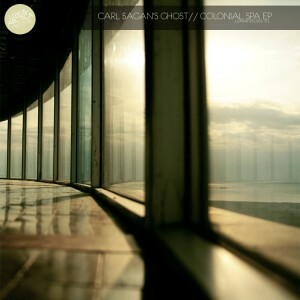 The half hour or so it takes to listen to the most recent release from Carl Sagan’s Ghost, Colonial Spa, is likely to be one of the most laid-back and soothing stretches of time you’ll spend. This is space-lounge cool at its finest, a gravity-free mind-massage while beat-pulse engines ease you into orbit around a planet made of 100 percent chill. And, of course, someone hands you a complimentary and suitably spacey cocktail in the middle of it all. Well-meant metaphor aside, Colonial Spa is, for a relatively short offering, a real pleasure to get lost in. Daniel Davis pulls together his several downtempo grooves, folds in subtle hints of dub, smooths it all out with soft washes and airy pads and carefully places effectively infectious rhythms, all without a bump or harsh edge to be found. Everything moves with the grace of Davis’ conceptual “low-orbiting satellite spacestation where beings from around the galaxy gather to relax, trade, and converse” spinning quietly in space. He smartly leads many of the tracks here with sounds that have a round, soft feel: the muted vibraphone-like tones that bounce around “Meccahnomad” and the pizzicato-esque backdrop and repeating three-note phrase in “A Place to Kill Some Time” are solid examples. Crisp microtonal sounds flecked throughout the mix add texture and secondary percussive elements, and Davis’ own attention to the depth of his sounds brings a richness to the already soothing character of his tracks. I know that I’ll be booking more–and more frequent–flights to Colonial Spa. It’s a relaxing place and you can’t beat the view, especially from the spinward side. Join me there sometime. First icy Jovian cocktail’s on me. Colonial Spa is a Hypnagogue Highly Recommended CD. Available from the Carl Sagan’s Ghost web site. Thanks for the well-written review. Really glad you enjoyed the EP as much as you did.